1.Bonds are Safe? 30 Year has Lost 15% Since August and 12% Since October. 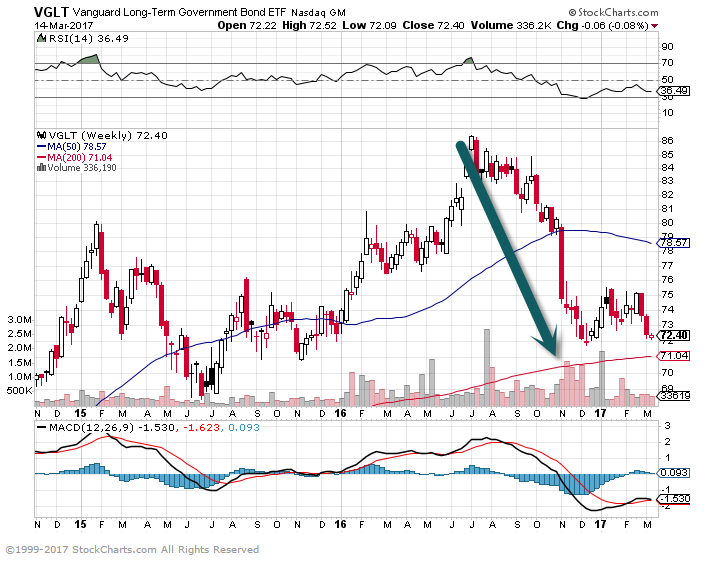 VGLT-Long Term Government Bond ETF. 2.10 Year Yields Hitting 20 Year Trend Line. For some perspective on long-term interest rates, today’s chart illustrates the 117-year trend of the 10-year Treasury bond yield (thick blue line). It is worth noting that the yield on the 10-year Treasury bond has been declining since the early 1980s. More recently, the 10-year yield has spiked to 2.6% and is now testing support of its 20-year downtrend channel. One point of interest… Spikes in long-term yields tend to be a relative negative for the stock market as it tends to discourage investment while increasing the burden of existing debt. For example, the last two times the 10-year yield hit (early 2000 and 2007) support (green line), the stock market soon followed with a major decline. 3.S&P Crushing Small Cap in 2017…. S&P +5.66 % vs. Small Cap +40bps. Investors may have noted how the shine has come off one of the postelection “Trump Trade” winners. 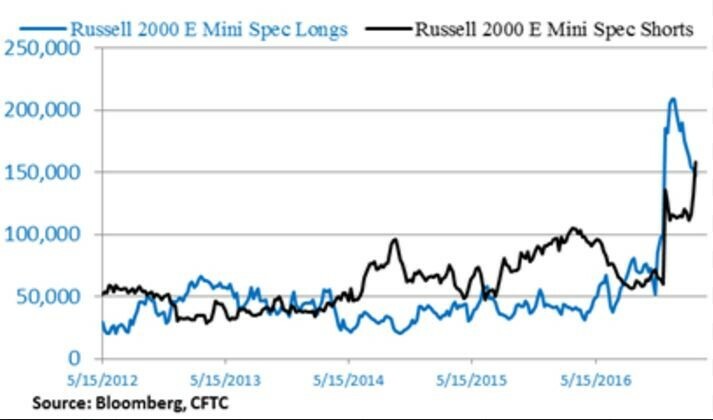 The Russell 2000 RUT, -0.58% is up a mere 0.4% year-to-date, versus the S&P 500’s respective 5.66% gain. JonesTrading’s Michael O’Rourke explains that a massive buildup of bets that the index will move higher (via futures contracts), have been unwinding. Those bets hit an all-time high in the first week of 2017. 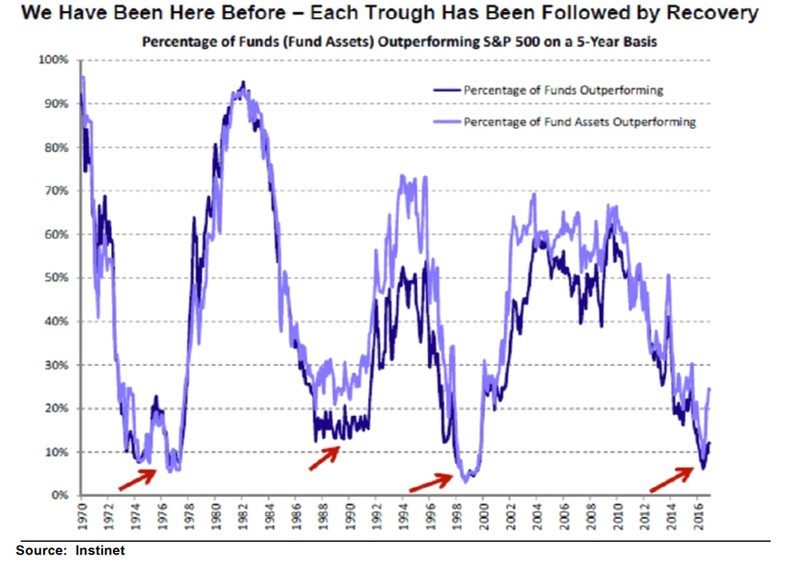 The Percentage of Funds Outperforming when Cycle Turns has been Coming Down Every Decade. Chart from Rick Golod Global Investment Strategist. 5.U.S. 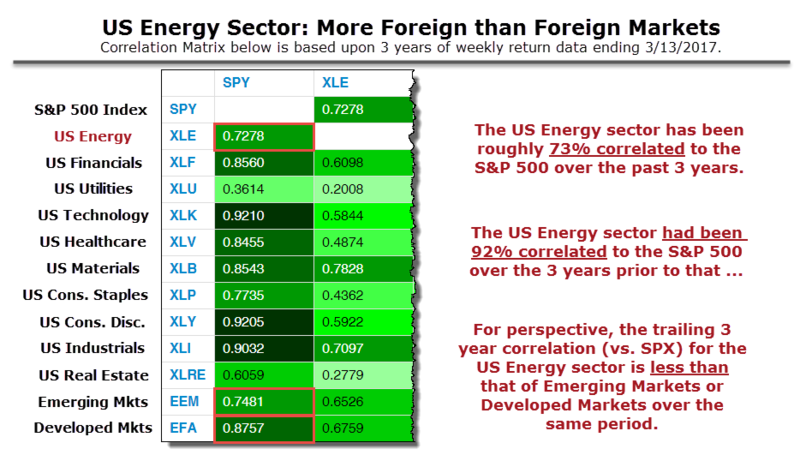 Energy Sector’s Correlation to S&P Sinking. 6.Since 1954…9 Out of 13 Times…Stocks have Moved Higher with Interest Rates. It’s always tough to cram several decades worth of data into one chart, but figure 1 tries to do just that. 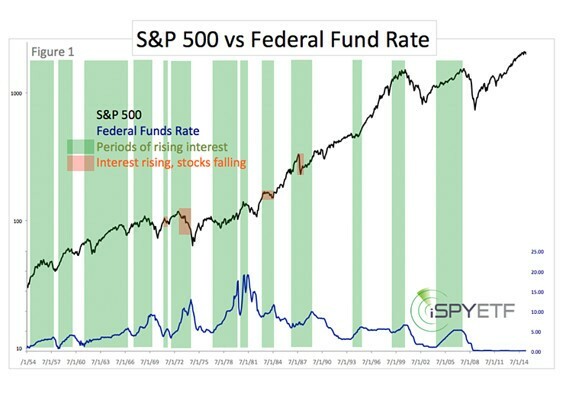 It plots the federal funds rate against the S&P 500, going all the way back to 1954. The green bars highlight 13 notable periods of rising rates. 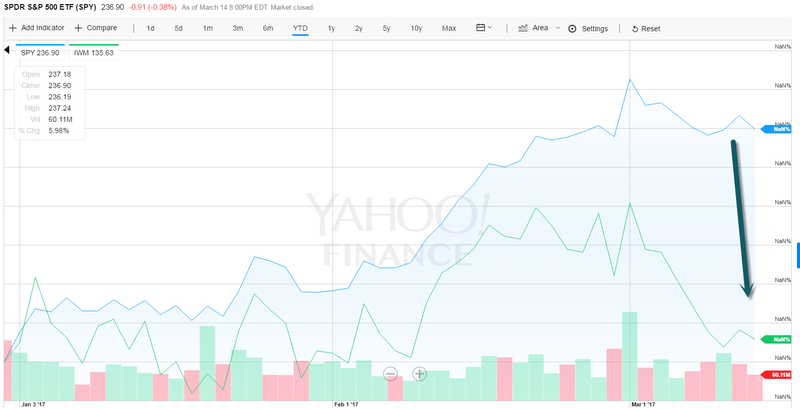 Nine of 13 times (69%) the S&P 500 moved higher along with interest rates. Most recently, interest rates rose from July 2004-July 2006 and July 1999-June 2000. So did the S&P 500. 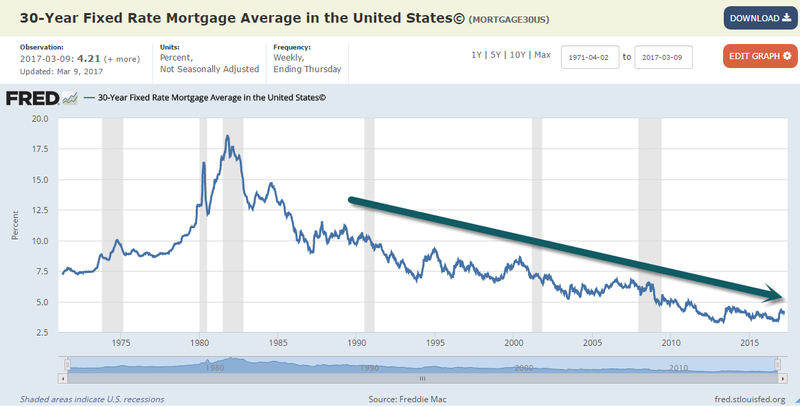 7.Fed Rate Hike Day….Mortgage Rate Watch? If the Fed hikes rates three more times this year, and a few more times next year, the ten-year Treasury yield could rise north of 4%, and mortgage rates north of 6%. The last time mortgage rates were anywhere near 5% was in February 2011. The last time they were in the 6% range was in November 2008! 8.Small Business is Responsible for 90% of Job Creation…. Learn more about Bespoke’s research and wealth management services. 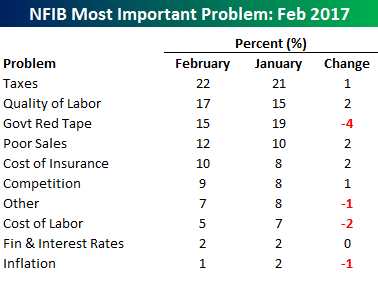 Within each month’s survey, the NFIB asks small business owners what the number one problem is that they face in running their businesses. In this month’s data, we saw a lot of sizable changes. For the first time in a long time, Taxes and Government Red Tape are not the two top problems cited. Taxes remain at the top with 22% of small businesses citing it as their number one problem, but Govt Red Tape saw a sharp drop in the percentage of businesses that cited it as their number one problem, falling from 19% down to 15%. At the same time, Labor Quality moved up two percentage points from 15% to 17%. In terms of Labor, the increase of businesses citing Labor Quality as their number one problem could ultimately lead to increased labor costs down the road as business owners are forced to pay up for better workers. That didn’t show up in this month’s report, though, as Cost of Labor was actually only cited by 5% of small business owners as their number one problem, which was down from 7% in January. 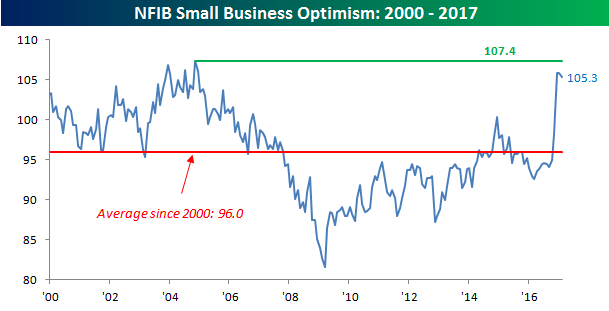 The charts below show the change over time in the percentage of small businesses that cited Quality of Labor and Government Red Tape as their number one problems. 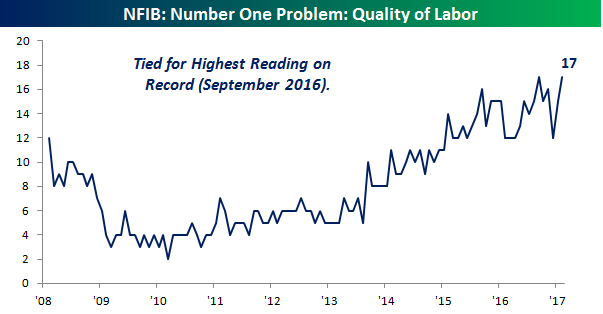 In the case of Quality of Labor, this month’s reading of 17% is tied for the highest reading in the history of the survey going back to 2008. 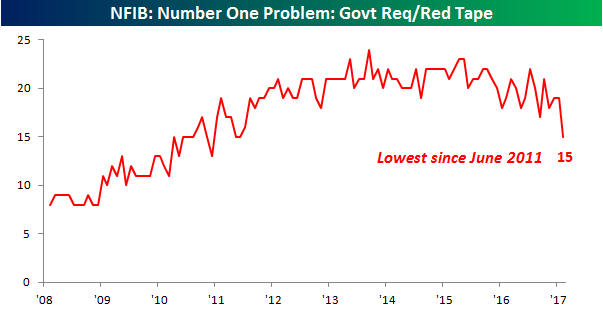 Meanwhile, the 15% of small business owners that cited Government Red Tape as their number one problem dropped down to its lowest level since June 2011. It’s amazing what a changed tone out of Washington can do for sentiment. To see Bespoke’s full line of macro and micro research, sign up for one of our premium membership options today! You won’t be disappointed. Deals won’t be getting any cheaper, consulting firm predicts. Private equity firms had as much as $1.47 trillion in funds available to invest at the end of 2016, and debt capital was also readily available to bolster their investments. Still, a situation of rising asset prices, together with fierce competition for these assets in an environment overcast with a possibility of an upcoming recession that could drive down prices, made it difficult to close deals, according to an annual global private equity report from Bain & Company. These firms are cautious about whether today’s deals will bring them to their targeted returns. Banks are also wary of financing big deals. Investors continued to show interest in private equity in 2016, and these firms raised $589 billion globally, just 2% shy of the 2015 total. One 2016 trend to note is the rise in “megabuyout” funds that raised more than $5 billion each, with 11 such funds raising a total of $90 billion. These funds appear particularly appealing to institutional investors who want to deploy large amounts of money into private equity, the management consulting firm reports. And an overall decline in the net asset values of buyout firms, as their distributions to investors outpaced their new investments plus the value of their existing holdings, meant that some investors found themselves short of their targeted private equity allocation. For instance, the Washington State Investment Board pension fund found its private equity allocation down to 21% in 2016, from 26% in 2012. This created a positive environment for private equity fundraising in 2016, but the industry is apprehensive that this strong pace cannot last for too long, as a recession and a stalling stock market, for instance, could upset the strong dynamics. The buyout market started off slow in 2016, as the Chinese stock market bust, declining oil prices and the uncertainty regarding Brexit in Europe all had an impact. In North America, the market did not recover momentum and the total number of deals for the year was down 24%, with deal value off 16%. In Europe, there was a more moderate drop off. Bain finds that there is a potential for almost 800 public companies to be taken private in buyouts, but expects a much lower level of actual public-to-private buyouts going by historical activity. While returns on private equity buyouts continue to outshine the returns on public markets, the gap is closing, as it is getting harder for private equity to find outsize returns on undervalued assets in today’s more benign economic environment. Private equity investors have also settled into longer holding periods of about five years for their investments, and this state of affairs is likely to endure for the near term. Historically, these firms have held on to assets for three to five years, but this period was pushed up in the aftermath of the financial crisis as firms had to nurse their assets over a slow recovery period, the management consulting firm reports. In fact, deals that private equity firms were able to quickly flip over, holding onto them for less than three years, made up a mere 18% of private equity buyouts in 2016, compared to a 44% share in 2008. It’s old news that we’re busy and that we wear our busyness as a badge of honor. But a new study found that Americans, in particular, are actually buying it. Specifically, the study concluded that Americans who always say they’re “busy” are actually seen as more important. Unfortunately, it’s all a charade. Numerous studies have shown that busyness isn’t actually good business, and here’s the big reason why: It makes us less productive. We’re all susceptible to it, but If I’m saying to myself (and I have), “Woo, I’m busy; really busy,” I’m likely being distracted from the most important, most productive work that I could be doing. I may feel like I’m doing more, but the net result is actually less. And it often feels like it. How do you know when you’ve gotten too busy? What is a technique that you use to “unbusy” yourself? I don’t mind working hard and taking on lots of projects–in fact, I wouldn’t have it any other way—but when I have no time to think, then I feel too busy. It can be hard to dig myself out of a busyness tunnel. However, one tactic I use is to look through my upcoming calendar and cancel anything that doesn’t seem essential. It’s likely I’ll still have a number of commitments to see through, but even a little relief can help to restore order. You find yourself dreading lots of tasks on your calendar or you don’t have the energy for things you normally like to do. And if you have a lot of activities in your life that you feel like you’d pay good money to offload—that’s probably a sign too! Sometimes our calendars need a radical makeover. People had been talking about decluttering for years, but Marie Kondo changed the conversation by flipping it from getting rid of stuff you don’t like to only keeping stuff that “sparks joy.” This is an interesting thought for a schedule. What would it be like to only have activities in your life that “sparked joy?” It’s probably unworkable in practice, but it’s a goal to keep in mind as you evaluate your schedule. My eyelid starts to twitch from the raw amounts of caffeine I’m using and coffee no longer touches the tiredness. My inbox is also a canary in the coal mine. When it’s out of control, I usually am too. I exercise. It’s hard to multitask when you’re running or swimming. I also turn my phone off. It’s a distraction buffet. My day has started and I haven’t taken time to write down my 5-6 high-priority to-dos. Put down my phone, close my laptop and pull out my daily written to-do list and re-center myself. My perceived level of stress is on the rise. You can feel it physically (headaches, stomachaches, backaches) but your sleep often suffers as a result and you’re unable to focus as well as normal. As we write in AgeProof, you can’t deep breath away this type of stress, you have to attack it at its source. I slow myself down. That doesn’t exactly move things off my plate, but it does make sure that I do them correctly the first time which means I don’t have to re-do them. You stop appreciating what you’ve achieved. If you can’t take a moment to enjoy the fruit of your labor, then what’s the point?! Marking the occasion. Be it a dinner with friends, or a better cup of coffee, celebrate your accomplishments. It’s not only about patting yourself on the back, it’s about having a moment of closure to catch your breath and regroup. It’s a critical pause that allows you to take a step back to get perspective and reconnect with your purpose. If your heart is in it, then your mind will follow. Working intelligently is not about being busy, it’s about being productive. It’s a feeling, and the key (for me) is learning to notice it instead of drifting through life letting IT dictate how you live and interact with the people around you. Some clues for me are feeling rushed, holding my breathe a little bit while completing tasks, impatience with people I love, faultfinding with others’ work, and a sense of self-centeredness or self-importance. First test: Go hang out with a two- or three-year-old. If you find yourself rushed, you fail. Second test: Are you responding to “How are you?” using either “So busy!” or “Busy man…but it’s better than the alternative”? Another fail. 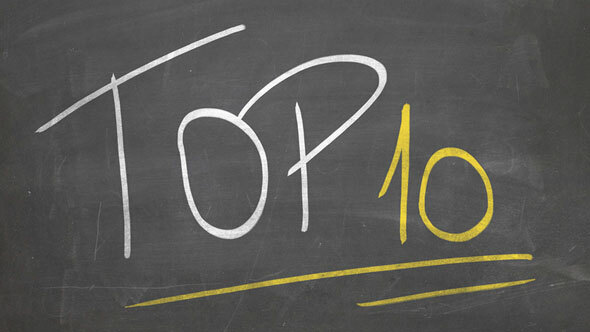 Solutions: First, acknowledge you failed the test—you’re either too busy, or acting too busy. Second, start paying attention, and finally, follow your breath. Busyness, alone, isn’t the problem. The loss of intentionality—being “reactively busy”—is. Manically crossing off to-dos without regard to who put them on your list and whether they matter to you is when things fall apart. What’s the big tell? If you find yourself at the end of a breathlessly packed day, having accomplished very little that truly mattered to you, it’s time for an intervention. It starts with awareness. You can’t choose differently until you become aware of what you’re doing in the moment. Set “awareness triggers” on your mobile device to vibrate in a distinct pattern and let you know it is time to pause for a moment, consider what you’re working on and whether you’re investing your energy in something with intention and purpose, or simply defaulting to the compounding agendas of others. You find you don’t have the time to spend with friends. Or with your spouse and children. Or when you don’t have time to take a vacation. Or when you just feel exhausted from running too hard for too long. Saying “no” more often. Greg McKeown’s Essentialism makes this point incredibly well. As I wrote on the blog, most of us get stuck thinking that we have to accept every opportunity that comes our way, and over-busy ourselves. It’s entirely a mental challenge we inflict upon ourselves. Which I say as someone who’s heavily self-inflicted this many times over the years. An additional piece of interesting work lands on my plate and instead of being excited for the opportunity I feel my whole body tensing up. I either do a 20-minute, high-intensity cardio workout (alternating 60 seconds of all-out effort with 60 seconds of recovery) when I can or I will take 20 very looong, slow deep breaths. Both have the physiological effect of “rebooting” me. You look at your calendar and feel dread. First, triage your calendar. Then, learn to say No with grace. If you can’t start saying No, you will end up right where you are now. No matter what entrepreneurs like me are doing, we can easily be distracted by something else, leading us to not be fully present no matter where we are or who they’re with. When an opportunity does come along, when something big and exciting could be launched or decided, we’re not conscious enough of the opportunity to take advantage. Avoiding the “too-busy” trap. I take scheduled free days where I do no work-related thinking or activities for 24 hours to completely detach myself from my business. No emails, no reading and no talking to others about work. While counterintuitive, it’s so rejuvenating to return energized, creative and present. The most convincing proof that these thought leaders are doing what they wrote? All of these apparently busy people had time to answer my two questions within several hours of my asking them. How might your life and work look different if you followed the footsteps of these wise men and women who’ve found joy in rejecting busyness as a badge of honor? This post was initially published on Forbes.com..